Foodprint aims to raise awareness of water consumption through an innovative and visually eye-catching app! Foodprint is an app that addresses the sustainability issue of water usage in the products we consume. By scanning the barcode attached to the price tag of grocery store items, the app displays how much water it takes to provide the produce. Foodprint involves a built-in water grading system—these indicate roughly how many liters of water went into the production of a specific product. We inform customers of how much hidden water is in what they buy, which in turn encourages them to compare across brands and choose a water-wiser option. By simply presenting facts to our audience, we can tackle the issue of water over-consumption through the small step of awareness. Focused on front-end CS / design (UX and UI). I was able to work more on how to use Figma, Photoshop, HTML/CSS; I was also about to write up a little bit of a case study at the end! I worked on the wireframing, prototyping, and product design of the application (UI/UX). 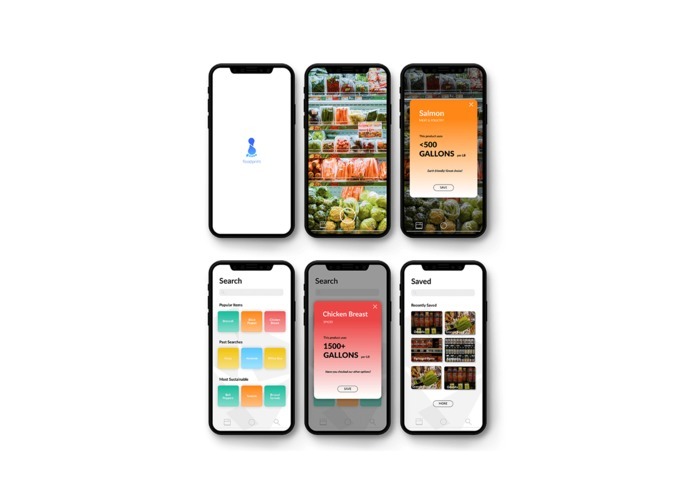 Beginning with app research and digital iterations on Figma, we were able to create an interactive prototype on InVision. Furthermore, I designed the logo and physical barcode of Foodprint and developed the target persona. I worked on the IOS development using Swift. It was a little intimidating as it was my first time coding in Swift, but it was a great learning experience! Idea for project came from previous design project prototyped last year. Worked to extend idea to iOS application using Swift. Without previous experience, I contributed in creating a basic interface that would navigate between essential features of the application. Relied on Xcode and Git.